William Robert Scott’s academic reputation rests on his economic history, particularly his mammoth three-volume work, The Constitution and Finance of English, Scottish and Irish Joint-Stock Companies (1910-12). However, before and after that work, William Robert Scott wrote on the history of philosophy, particularly on Francis Hutcheson and Adam Smith. Scott was born in Omagh Co. Tyrone on 31st August 1868, to a family of millers and landowners descended from a Robert Scott (1698-1777) who settled in Ireland in the 1720s. Educated in Belfast and Rathfarnham in Dublin, Scott then studied in Trinity College Dublin, graduating BA (1889), MA (1891) and DLitt (1902). He was also a freelance teacher and writer in Dublin until his move to the University of St Andrews in Scotland. There he became a Research Fellow, graduating DPhil (1900), acting as assistant to the Professor of Moral Philosophy (1896-1901) and as a lecturer in Political Economy (1899-1915). In 1915 he was appointed Adam Smith Professor of Political Economy in the University of Glasgow, remaining there until his death. Throughout his time in Scotland, Scott was also been involved in numerous committees. Made chairman of the mill in Omagh in 1897, he continued to supervise the family business in Tyrone. No wonder that on his death at University Gardens, Glasgow on 3rd April 1940, his university supervisor described Scott as “quite indefatigable”. Scott’s first work, A simple history of ancient philosophy is aimed at the reader who knows nothing of the subject and find that “philosophical textbooks are unintelligible without a history, and the history is inaccessible without the terminology of the textbooks!” Scott aims also to convey the philosophers as men struggling with problems rather than as thinking machines. In 124 pages he covers the preSocratics, Socrates, Plato, Aristotle, the Stoics, the Epicureans, the Sceptics and neoPlatonism. Scott’s main work of philosophy from his early life is his Francis Hutcheson: His Life, Teaching and Position in the History of Philosophy (1900). This detailed intellectual biography is still the only complete and substantial life of Francis Hutcheson. It draws together existing sources from Presbyterian histories, from Leechman’s biography (included in Hutcheson’s 1755 System of Moral Philosophy) and previously untapped correspondence, particularly that preserved by the Drennan family. Scott deduced likely dates for key events and, as with his earlier work, he also conveys Hutcheson’s personality. Scott was writing in a Dublin much less altered than it is today; he is able to tell us that “the memories of the friends [Hutcheson and Bruce] are preserved by a broken and defaced gravestone” (p. 142) – a stone moved and almost entirely buried today. Scott also analyses Hutcheson’s philosophy, its influences and its impact on philosophy in general. It is as part of this analysis that Scott coins the term “Scottish Enlightenment”, though his account of it has now been superseded (Broadie, 2003, p. 3). Scott was also the first to pay academic interest to James Arbuckle, who sank into obscurity in the later 18th and 19th centuries. His paper on Arbuckle and the “Molesworth-Shaftesbury school in Dublin was published in Mind, with some material also used in the Hutcheson biography. Appropriately enough, as holder of the Adam Smith Chair in the University of Glasgow, Scott became an expert on Adam Smith. He released a new edition in 1921 of Wealth of Nations for which he wrote an introduction. In 1937 he published Adam Smith as Student and Professor which he describes in the introduction as akin to a detective novel. 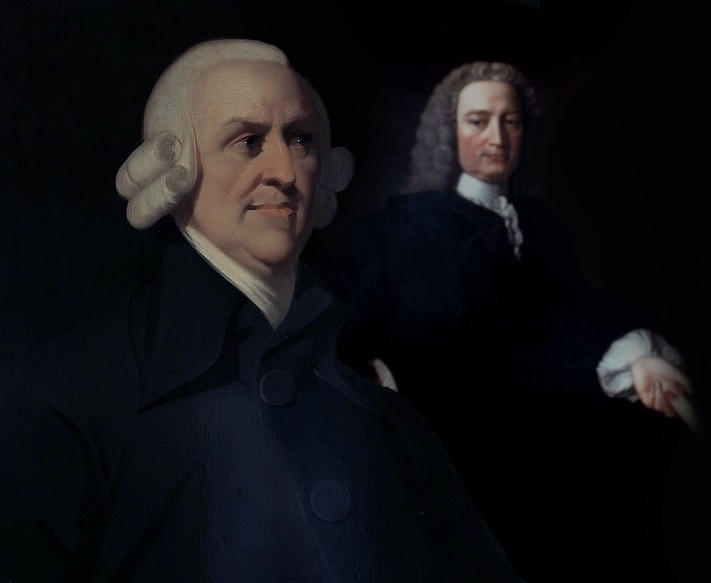 (The 1938 review by Ray calls Scott, “the Poirot of economics.”) The book includes new biographical information on Adam Smith, and information on the his thought, particularly the early development of Smith’s theory of distribution. Ray also notes that in this book, “[Scott] shows himself to be a philosopher, critic, and connoisseur.” This is a fair assessment – as well as his other interests Scott left a collection of Renaissance prints to the Hunterian Art Gallery, Glasgow. His obituary in the Economic Journal sums him up thus: “Nothing economic — speculative, historical or applied — was alien to him” (quoted in Deeson & Scott (2002), p. 42). Philip de Bary (2004) “Scott, William Robert” in Thomas Duddy (ed) The Dictionary of Irish Philosophers, pp. 296-7. Alexander Broadie (2003) The Cambridge Companion to the Scottish Enlightenment. C. R. Fay (1938) “Reviewed Work: Adam Smith as Student and Professor. With Unpublished Documents, Including Parts of the “Edinburgh Lectures”, a Draft of The Wealth of Nations, Extracts from the Muniments of the University of Glasgow and Correspondence by William Robert Scott” in The Canadian Journal of Economics and Political Science / Revue canadienne d’Economique et de Science politique, Vol. 4, No. 1 (Feb., 1938), pp. 101-110.